The person outside the "Golden Domes" cinema in Streatham High Road is Andy's father, Reginald F Andrews. Note the ornate gas street lamps, and tram line in the road. 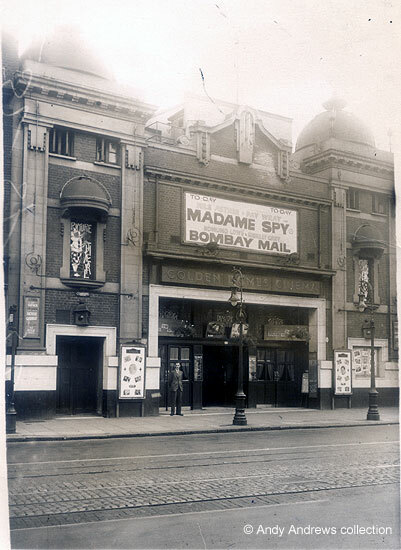 Whilst Reg thought the picture was taken in 1937, the two films being shown were released in 1934 and were screened at the "Golden Domes" between 30th July and 4th August 1934. Very welcome information also came from Spencer Hobbs who has researched the "Streatham News" archives and found the advertisement on the right which nicely places the photograph to the week commencing 30 July 1934. In retrospect the lack of ABC logo (see below) should have alerted us to a date earlier than 1935. Spencer tells us that the Golden Domes was one of six cinemas to have existed in Streatham. Advert from the "Streatham News," 30 Jul 1934. Reg grew up in Didcot, Berks but showed a great interest in the cinema and things technical from an early age. He worked at his school's Cinema Club in Didcot during his early teens and by the time he was 16 he was 4th Operator at a cinema in Reading. After a move to Yeovil to help open a new cinema there Reg moved to the Golden Domes as Chief Operator in 1932. 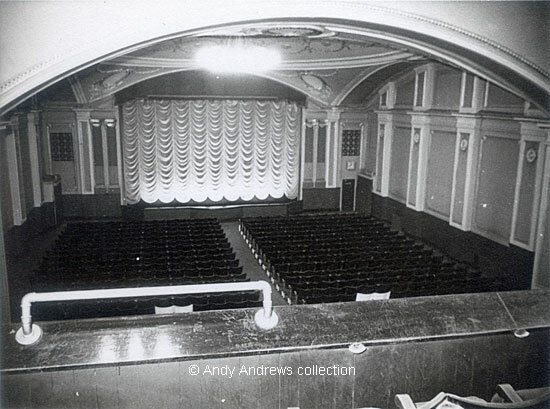 The cinema was bought by the ABC group (Associated British Cinemas) in 1935 at which point he became its Manager. 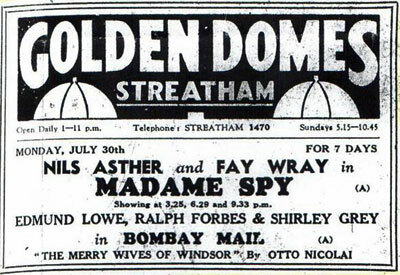 The "Golden Domes" showed its last film in November 1938 when it was replaced by the new Regal, Streatham that had been built further along the High Street and opened on 14 November. 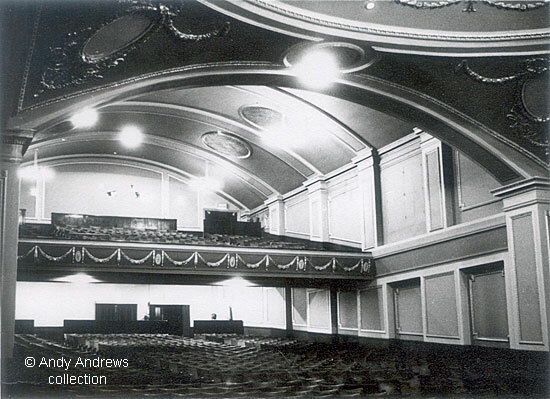 It had 2,000 seats, so had a much bigger capacity that reflected the popularity of cinema at that time. Mr. Linden had been appointed as that cinema's manager. 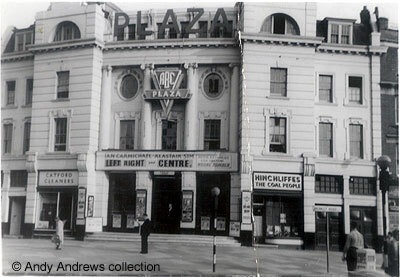 The Plaza, Catford (right) was Reg's next cinema and he returned there several times later in his career. We have other photographs showing the World famous clown, Coco, outside the Plaza when he visited the cinema to promote road safety for children. Ian Carmichael and Alastair Sim, was released in 1959. In 1941 Reg was called up and appointed to the Army's Cinema Service (part of the RAOC) and in 1945 he was selected to join a then secret mission on the Cunard ship 'Franconia' taking senior officials to the Yalta Conference (attended by Churchill, Roosevelt and Stalin). During the voyage he showed films to Winston Churchill, Anthony Eden, Viscount Alanbrooke and, once arrived at the conference, Molotov. Many of the films were from the war front, and he was told never to discuss what he saw and heard, but some of the popular movies of the day were also screened to provide some lighter moments. 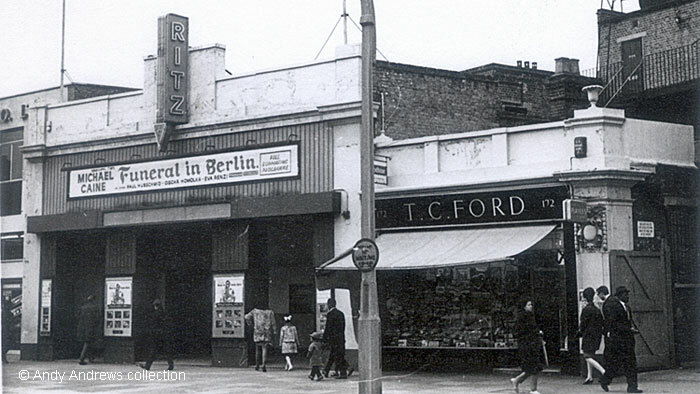 After the war Reg worked at a number of South London cinemas including the Regal, Streatham; the Rex, Norbury and the Capitol, Forest Hill. At the Capitol, Andy, then aged about 5, was introduced to Dulcie Gray and Michael Denison who were promoting their latest film, "The Glass Mountain". Finally he went to the Ritz, Balham, shown on below. "Funeral in Berlin" was released in 1966 and starred Michael Caine as Harry Palmer and Oscar Homolka as Colonel Stok. Brian recently discovered that the facade of the Ritz underwent a re-build in the early 1950s and the balcony was installed at the same time. Just to the left of the Ritz can be seen the offices of Pearl Assurance, situated above a small supermarket; the latter was opened by Jimmy Edwards and Brian still has his autograph in the front of a copy of a Green Shield Stamps catalogue from that day. Ronald Alexander-Mace from Norbury South London was an ABC employee between 1948 and 1954 and remembers Andy's father well. ABC's policy of moving young managers from place to place, and using them on relief duties, ensured that Ronald's career involved periods covering a very wide area of South London: Regal Purley, Savoy Croydon, Palladium Brixton, Regal Beckenham, Majestic Mitcham, Picture House (Ritz) Balham, Prince of Wales Lewisham, Capitol Forest Hill, Mayfair Tooting, Regal Streatham, Rex Norbury, Plaza Catford, Regal Sidcup, Ritz Erith, Regal Bexley Heath, Regal Old Kent Road, Regal Camberwell, Elephant & Castle (guess where that was! ), Princess Crayford, and one at Gravesend. The list of locations is testament to the scale and importance of cinemas in our national life in those days. Where once huge numbers of people would regularly come together 'at the movies', many now stay at home and watch TV or DVD, possibly on their own. Ronald recalls the screening of an experimental 3D movie at the Plaza Catford and of the nightmare when one of the two projectors broke down; he had to make several announcements from the stage - to assorted catcalls and a slow hand clap from the audience - as efforts were made to get the show going again. It is an understatement to say that Ronald is a cinema buff - in 1952 he was a founder member of the Cinema Organ Society and still owns and plays a Hammond. Perhaps he can be persuaded to write his memoirs one day. The following picture of the Rex Norbury is reproduced with Ronald's kind permission. Note the friendly constables providing gentle crowd control (those were the days!). The films being shown are "Swing Time" and "Mister Cinderella", both made in 1936; the latter starred Jack Haley who was perhaps best known for his part as the 'Tin Man' in The Wizard of Oz made in 1939. 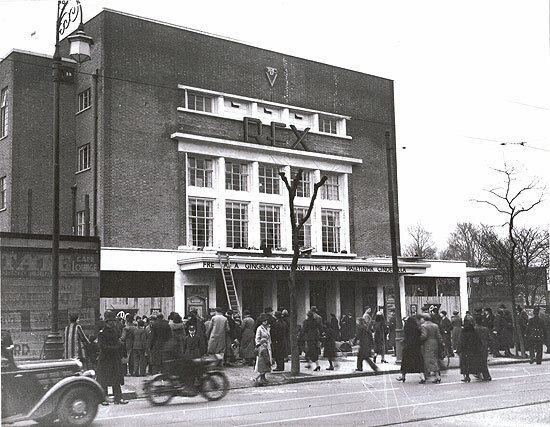 It is known that the Rex opened in 1937 and the winter coats and leafless trees suggests the photo was taken in Jan/Feb of that year. Also the small shops either side of the entrance are still boarded up and incomplete, so we might guess that the official opening day was close. Possibly the crowds and police presence are evidence of the picture being taken on opening day itself. Note the small logo near the top of the building and compare it with the grand version later applied to all ABCs like the Plaza, above. The Rex was eventually turned into an office block where, quite by chance, Ronald was later located while working in a quite different industry. Anyone interested in London cinemas might be interested to read "The Cinemas of Croydon" by Allen Eyles and Keith Skone. Advertisement from the Streatham News provided by Spencer Hobbs. Photograph of The Rex, Norbury © Ronald Alexander-Mace. All other photographs in the collection of, provided by and © Andy Andrews. Written, researched by and © Andy Andrews with additions from Brian Eady, Spencer Hobbs and Ronald Alexander-Mace. The dates were found in the "Norwood News" of 27 July 1934 and the "Norwood News" of 3 August 1934. We are most grateful to Spencer Hobbs for both getting in touch and for giving permission to use this picture. Spencer has produced a book about Southwark Cinemas (due for publication Summer 2012) and one on Lambeth Cinemas is in preparation. Anyone interested in this largely lost golden era should look out for both. "Norwood News", 4 November 1938 shows that "Woman Against Woman" and "The Terror" were screened from Monday 7th Nov for six days, with three shows for each film.